Sony Ericsson brings its first Android handset to AT&T with the Xperia X10. While it shines in some places, the X10 is quite dull in others. Find out where it excels and where it falls flat. AT&T has added the Xperia X10 to its slowly growing arsenal of Android phones. The X10, made by Sony Ericsson and first announced in October 2009, doesn't break any new ground in terms of physical design. It does, however, go further than many other Android handsets when it comes to Sony Ericsson's unique user interface software. The software definitely makes the X10 stand out in AT&T's cluster of Android smartphones. Is that alone enough to make it a contender? Phone Scoop takes an in-depth look at the Sony Ericsson Xperia X10 in this video tour. It is one of the first Android phones from Sony Ericsson. Both the Motorola Droid X2 and the Sony Ericsson Xperia X10 can be updated to Android 2.3 Gingerbread thanks to Verizon Wireless and Sony Ericsson. Droid X2 owners can update their handset over the air using the on-board system update tools. 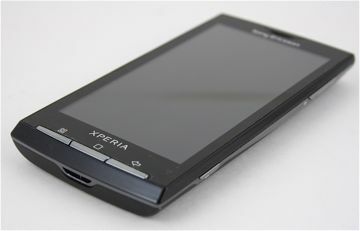 Sony Ericsson has made Android 2.1 Eclair available to AT&T customers with the Xperia X10. Eclair updates the X10 from 1.6 Donut. I heard rumors that this phone is being update to android 2.1 or possibly 2.2 during the fourth quarter this year and if it is true does anyone know what are the possible updates for it? Who packages SD cards (and other accessories) with the phone? This article claims the carrier does, is that the case? There are three different email apps, Gmail, pop/IMAP, and a work email (exchange) app. Sorry Sony while this was an amazing phone when it was first announced, almost a year ago, its just average now. The phone should have been released 6 months ago. And releasing it with 1.6 is just unacceptable. You are crippling your customers who will not have access to a lot of the newer apps. 2.2 has been out for a few month and 2.1 has been out for even longer, there is no reason it should have 1.6 on it. Sorry I'll stick with my Vibrant which is 100x better than this. what?? no comparisons to the iPhone??? All - We shot an extensive look at the Xperia X10 on video months ago. I added it to the review to refresh your memory. I had a chance to play with the X10 at a local Sony Store--it's the best looking/feeling piece of hardware I've ever laid eyes on. Still, great phone! and greater with Android 2.2, next month!! !